Call today for quality water care or equipment sales and service! spas and water features, in addition to professional repairs on all makes and models of pool equipment. All brand of heaters with various BTU ratings to meet your pool or spa heating needs. Complete line of cartridges and D.E. filters available for your specific application. Pool and spa pumps from 3/4-hp to 6-hp as well as Variable Speed pumps for low cost operation. Our goal is to maintain safe and clear swimming water for you and your family. pool or spa. We care for your water as if it was our own, paying careful attention to detail in regards to sanitation, chemical balance and visual appeal. 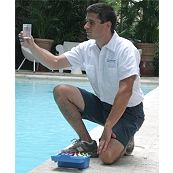 "Very knowledgeable and professional when it comes to pool care! After using several pool service companies in the past, Ace Pool Care is truely a one-stop shop as they not only provide weekly water care at an affordable price, but keep tabs on my equipment, notifying me of developing issues and can even handle the repairs which may be required. I have never had a better experiance with any other pool service company and highly recommend them to friends and family. - Jim Whitaker, Whittier, CA -. Copyright © 2013 Ace Pool & Spa Care. All Rights Reserved.